So Wednesday... there are truly no words for how much all the grey meant to me. I added more pictures today, so we are officially over 100. Throughout the day I was consumed with the pictures and messages from you all, wearing grey and thinking of Sweet Missy. Honestly, it was a little more emotional than I expected. Which I guess is ridiculous. How did I not know picture after picture full of love and support of my amazing baby sister might make my heart a little raw around the edges? But I really was taken off guard. But you all, it was totally and 100% worth the heartache. Because I knew you all were standing there with me, thinking of her, missing her, and understanding how hard this all truly is. Yesterday my sister-in-law, Candice, organized a charity powder puff football game and all the proceeds went to cancer research in Missy's name. We were actually at the game, on the field, when they presented the thousand dollar check in her name. It was amazing. And it made the edges of my heart just a little more raw. But completely in that good, loving, supported way. Now we are trying to switch gears. Henry's 4th birthday party is tomorrow. TOMORROW. And usually I might be weepy about that, but honestly I am possibly cried out. We shrank the guest list considerably from last year. Like, by half. We really planned on this being a much smaller, simpler party from last year's epic Angry Bird Bash. 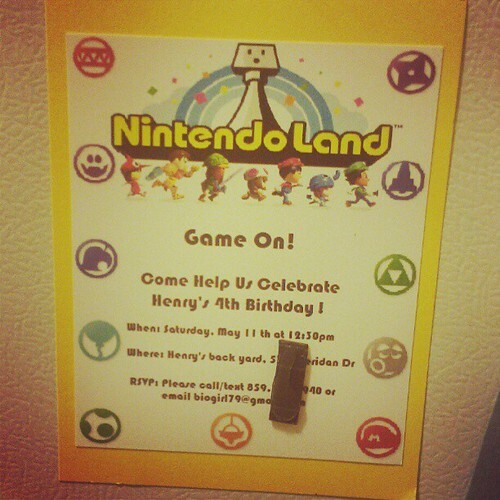 But Henry asking for a Nintendo Land party sparked the inner child in Nick**, who has made some extremely impressive games. I broke out my markers and did some drawings and mom got busy on the sewing machine... so the party is not exactly simpler, per se. But really, the party will be focused on the seven kids, and I think they will have a blast. I know for sure it will be a great memory for our sweet boy, which is the entire point. When I showed Henry his party invitation (which I totally designed by myself... PROUD!) he looked up at me and said "Is this for ME? For my NINTENDO LAND PARTY?!?! TANK YOU MAMA! TANK YOU FOR MY BIRFDAY PARTY!" So...yeah. How do you NOT throw this kid an awesome party? Look out, lots of party pictures, birthday slide shows and letters to come over the next few days. * Heh. My best friend suggested the Shades of Grey title, and the traffic it might bring in made me chuckle. Because... I bet they aren't looking for this! Heellllloooo Fifty Shades of Grey readers. Welcome. Support Brain Cancer Awareness. ** I am lucky Nick and I both go a little birthday crazy... it might be a little annoying if it was just one of us.